I recently took this picture from the rooftop of my loft in downtown Denver. It is a composite created from 38 individual lightning strike pictures taken over the course of 14 minutes. It shows an amazing lightning storm near downtown Denver, with the Ice House and Coors Field in the foreground. A number of people asked me for more information on how I took it, which seemed like a good excuse to try (again) to get more activity going on this blog! This is a post primarily for intermediate to advanced photographers – I plan to do posts aimed at all levels, and will include some more basic ones in future. You can buy prints of this image at my Smugmug page. 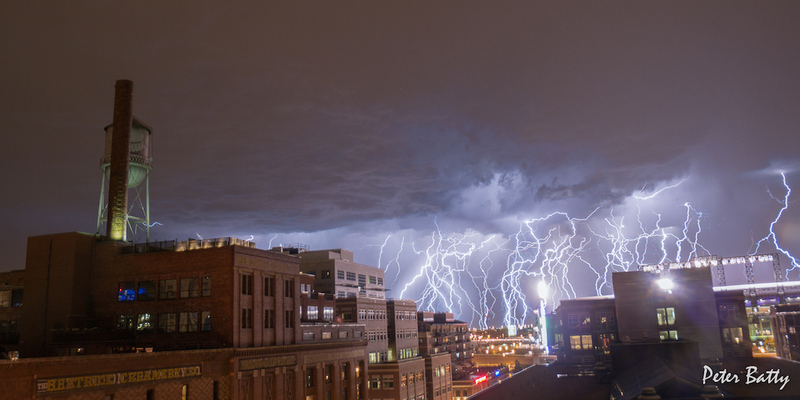 A composite image made from 38 lightning strike photos over the space of 14 minutes, in downtown Denver. I actually had no plans to take storm pictures on the evening that I took this. It was the evening of the annual Independence Day fireworks at Coors Field, home of the Colorado Rockies baseball team, and I was planning to take firework photos. 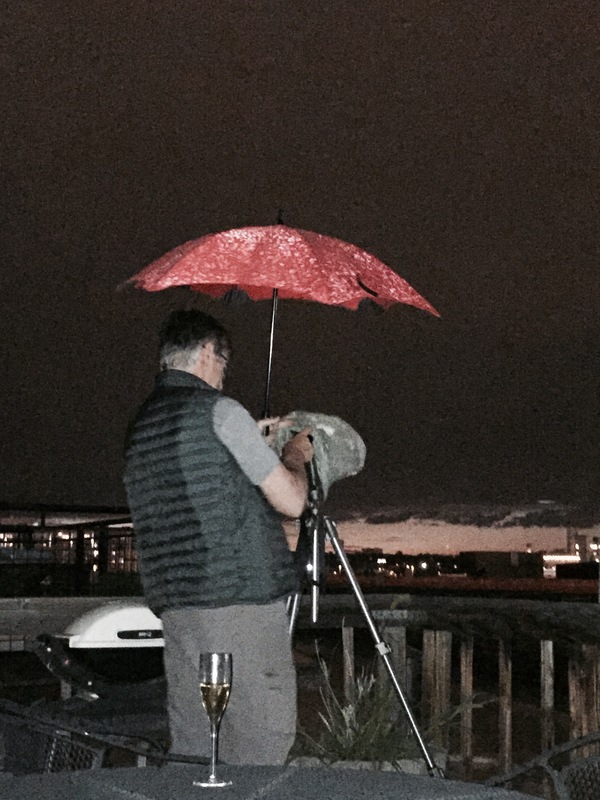 I was setting up my camera and tripod on our rooftop deck ahead of the fireworks, and saw the lightning in progress, so I had to improvise and act quickly. An advantage of this location, both for fireworks pictures and for this storm picture, is that it has a cool foreground, with the Ice House and its water tower on the left, and Coors Field on the right – this makes the picture a lot more interesting than if you just have fireworks or lightning by itself. I have never really done lightning photography before, but did know that the main trick to catch the lightning is to take long exposure photos, of several seconds – even though the lightning flash is brief, it generates enough light to be captured as part of a longer exposure. I looked around online after taking this picture, and thought that this article in particular gave some good tips. That article suggests that an exposure of 30 seconds is a good baseline to try for lightning photography in general. I typically use exposures of around 1 to 5 seconds for fireworks, which give good “light trails” effects. The camera I was using, the Lumix GX7, has a long exposure noise reduction mode, which I generally have turned on. This does some extra processing to reduce noise in the pictures – if you take a 5 second exposure, it processes for an additional 5 seconds after taking the photo. The drawback of this is that you have to wait to get another picture. At 2 seconds or less this processing doesn’t happen, you can take photos continuously. 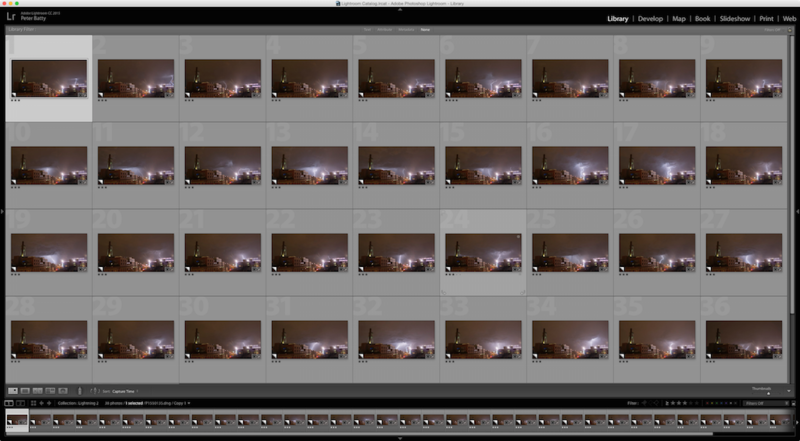 So I decided to go with taking a (more or less) continuous sequence of two second exposures. At some point I will try to experiment with doing longer exposure night pictures with and without the noise reduction to see how they compare – in this sort of situation it would be nice to do a continuous set of longer exposures. I set the camera in manual mode with settings of 2s, f/6.3 and ISO 200, the lowest ISO setting on my camera. I will do other posts that explain more about how to use manual mode. This is one of the very rare occasions when I use manual mode – some serious photographers use it a lot more, but I am a believer in using the intelligence of your camera, and probably only use manual mode maybe 5% of the time in quite specific situations. Doing a time series where you may want to combine multiple pictures, either into a time lapse movie or a composite image, is one situation where it’s important to have consistent exposure in all the pictures. And even without the sequence aspect, lightning, fireworks and night sky pictures are also situations where manual mode is important. For any long exposure you need a sturdy and stable tripod. If you are doing a sequence of pictures this is even more important. Like most aspects of serious photography, buying tripods can become expensive quite quickly. I have two relatively inexpensive tripods that I have been really pleased with. The first, which I used for these pictures, is an Amazon Basics 70″ Pistol Grip Tripod. It is amazingly inexpensive for a good tripod – $57.49 at the time of writing this, including a nice pistol grip head which is very easy to adjust quickly. It weighs 8.1 pounds and is very stable – so good for situations where you don’t have to carry it too far. More recently, I bought a MeFoto Backpacker Travel Tripod, which is more expensive, $149 at the time of writing, but it only weighs 2.8 pounds and folds up to be quite compact, so works much better with my lightweight travel philosophy, or if you need to hike with it. My camera has a built in time lapse mode, where you can tell it to take a picture every so many seconds for a long period of time. In this case I wanted to take continuous pictures to try to make sure I captured as many lightning strikes as possible. Though I have used the time lapse mode several times, I haven’t used it in exactly this situation, and wasn’t sure if I set it to take a picture every 2 seconds with a 2 second exposure, whether I would get the desired effect of continuous pictures, or whether I would have a 2 second gap between the end of one picture and the start of the next. Since the lightning was already under way, I didn’t have time to experiment and I elected to just hold down the shutter button on my cable release to keep taking pictures one after the other. I ended up taking around 750 pictures over a spell of maybe 30 minutes – the ones that went into the picture above spanned a spell of 14 minutes. From a quick test that I did just now, the time lapse mode on the GX7 doesn’t seem to support doing continuous bursts – if I set it to take a photo every 2 seconds with a 2 second exposure, there is a 2 second gap between the end of one photo and the start of the next. I tried setting an interval of 0 seconds but it wouldn’t take that – the minimum gap between photos seems to be a second. So my improvised approach of just holding down the shutter release for long periods seems as though it may be best bet with my camera at least. If anyone has any good tips on a more automated way of doing this please comment below! It was raining most of the time while I was taking these pictures. 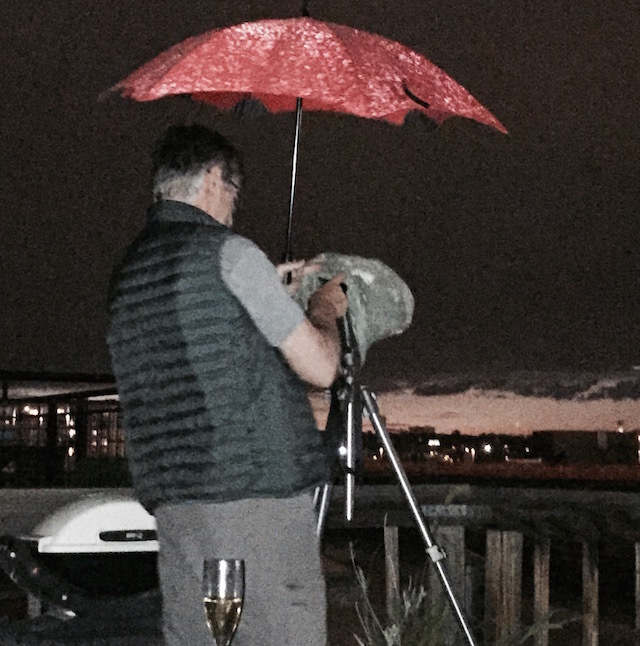 I had been meaning to buy a rain cover for my camera for some time but hadn’t yet! So I improvised with a plastic grocery bag that I tore a hole in to fit the lens through, and fixed it with a rubber band. And then I also held an umbrella over myself and the camera, to try to keep rain off the lens (a lens hood would have helped too, but I didn’t have one on the lens I was using and didn’t have time to track one down). I had to wipe rain off the lens a few times. Here’s a picture of the impromptu setup – sometimes a low tech approach does the trick! Since then I looked around online and have bought this Allura Photo Professional Rain Cover, which seems as though it will do a good job from some quick testing at home, though I haven’t used it in the rain yet. I use Adobe’s Lightroom software for nearly all my post processing, plus a few plugins that I will cover in other posts. I very rarely use Photoshop, but this was one of the few occasions that I did – it is needed to combine all these pictures into one image. I looked through all the images I took of the storm from that viewpoint, as I mentioned above about 750 of them, and added all those with lightning into a Lightroom collection, ending up with 38 pictures. I edited one of the pictures to get the settings how I wanted them. I always shoot in RAW format. If you don’t do this, I would say this is one of the biggest steps you can take to improve your photos – shoot in RAW and learn the basics of using a software package like Lightroom. You can do a much wider range of editing on RAW files than on JPEG, and it means that it’s less important to get your original exposure and other settings like white balance exactly right. One good tip in the article I mentioned above was that lightning tends to look better if you adjust the white balance to a lower temperature, to look more blue. I did this on my images and liked the result. Once I was happy with the edits on one picture, I copied those edits to all the other photos, which is a nice feature of Lightroom. To combine the pictures you need to open them in Photoshop (you can also load them straight into Photoshop if you are not using Lightroom). To do this, select them all, then choose Photo -> Edit in -> Open as Layers in Photoshop. This takes a little while with 38 RAW images, but you will end up with a Photoshop image with 38 layers. Only the top photo will show by default. You need to select all the layers on the right hand side – click on the first layer, then scroll down and shift-click on the last layer. Then select the pulldown above the layers and change it from “Normal” to “Lighten” and this will give you a composite image showing all the lightning! In general, if you quit from Photoshop at this point, your image with all its edits will automatically be saved back to Lightroom. In this particular case, my image was larger than 2GB, which is the maximum size of a regular photoshop file. They have a “psb” format for larger files but this is not supported by Lightroom. So I had to save it as a TIFF file and load that back into Lightroom to do a little final tweaking on the image. This composite image technique, often referred to as stacking, is definitely a good one to consider for lightning pictures. Even if you are trying to get individual lightning pictures, taking a sequence from a fixed tripod gives you the option of stacking if you want to. Having a stable tripod is obviously very important, as is making sure you get consistent exposure. Looking for a good foreground helps make a picture like this more interesting – this applies to lightning, firework or night sky pictures. Let me know if you have any questions or comments! You can buy a print of this picture from my Smugmug site. Have you tried turning noise reduction mode off on your camera to see if you can get similar results by post-processing the images on your computer, which should give your camera less computing work to do? Ken, thanks for the suggestion – as I mentioned briefly, I haven’t had a chance to test this out yet, but want to try that. But didn’t want to experiment with that while the storm was in progress. I will post again when I have a chance to do some testing! You’re welcome Ellen! Thanks for the kind comment!